What a cool idea Jill and Rachel have come up with. A way to support Indie designers and Charity at the same time. Love it! I also really like the patterns they chose for the very first release. So which pattern did I decide to make from this fun bundle?! Of course I chose the "Summer Concert Tee" by Dixie DIY. It's easy and quick which is all the time I have for me these days. I stuck with Dixie's styling and went with stripes but this quick sew took so little time that I have a few more planned for later that are non-striped. I will say this pattern isn't going to hold your hand as you sew but if you have a little experience and 1 hour then definitely go for it. I picked size 8 and it was a perfect fit. The only alteration I made because I'm a tad short was I trimmed off the back hem by 1" otherwise it was just a little too long. My husband appreciated that. :) If you're feeling charitable and supportive today then hop over to the PPP site and pick up your own pack. It's only available for 1 more day!!!!!! This week I shared an Ethereal tunic using Glitz fabric and mentioned I would be writing a bit about a couple different ways you can use the pattern to make it your own. My mother joined in on the fun and added little touches to each of the garments for my niece. On each piece she hand stitched a heart somewhere on the garment and gave Ofelia the task of trying to find the little hearts, some obvious and some slightly hidden. I think this is a great little thing you could do on multiple garments during the month of February or just once on their outfit to wear on February 14th. The first way to change up the blouse to offer a different look is to simply not use the frill in the front. Some girls just aren't frilly or you're a really smart seamstress/pattern maker and while putting together the instructions for the pattern you completely forgot to add it! (haha) Well a little error ended up being a great opportunity to show off this goodie. She used the running stitch to create this little heart inside a heart, a blanket stitch along the neck line and another running stitch along the hem. Mom also added a little heart cut out for the undershirt using Heat Bond (love). For this blouse I used Robert Kauffman Essex fabric that had lovely drape and is super soft. To pair with the blouse I add a UFO sitting in a box from almost 2 years ago that just needed buttons and a little extra love. The fabric I used for this Ayashe skirt was something Karen from OGC had found and made some yummy Dillinger pants with and I was instantly hooked. I found some at JoAnns and I bought 4 yards of it (4 years ago) because it had such nice drape. Whenever I come across a piece I think of her. Mom added red topstitching and a little heart. Next up a bubbled Ethereal blouse. For this look we omitted the frill once again and simply add 2" to the bottom of the Ethereal tunic hem length and cut 2 for the main and cut 2 for a lining then bubbled (tutorial coming soon). We used the long sleeve option but angled the sleeve slightly to give it a feminine touch. Fabric is by Bernatex. Can you find the heart? Lastly, I had created this Ethereal blouse when I was writing instructions for the pattern and there are no changes just a cute crocheted heart for a special touch. The fabric used was a brushed cotton I found at EE Schenck when picking up supplies for a sewing class. Super soft and perfect for the chilly weather season. I would love to see how you make a Figgy's pattern your own so upload a photo on the Figgy's Facebook page, flickr group or share on Instagram and use hashtag #figgys. 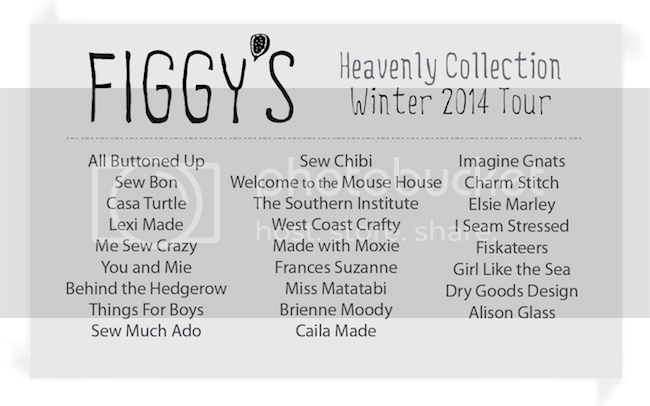 Beginning on February 4th the "Heavenly" pattern tour begins with a ton of wonderful bloggers/designers showing off their little or big Figgy garment! Stayed tuned to hear all about a BIG GIVEAWAY at the end of the tour!! I am so very excited to announce the news about my course for Craftsy "Kids Romper Revamp". It was such a fun experience and I was able to work with some amazing and talented people. If you haven't heard about Craftsy yet then I have to say I'm a little shocked but also excited to be the one who gets to share this terrific site with you. My most favorite part about this site is that it offers all sewists who would love to take a class the chance to do so no matter where they live and also it's interactive. I get to chat with you as you take the class, I love that! Here is a bit about my course. During childhood, play is paramount. So whether it’s a hot summer day or a chilly winter afternoon, kid’s need to be comfy in their clothes. Like adults, kids should enjoy the way their clothes look, as well as how they fit and feel. In sewing for kids, I use comfortable fabrics as a platform to build from. For this class, I wanted a platform that’s as comfortable for teaching as the romper is for wearing. That’s why I chose Craftsy. With Craftsy, you have unlimited access to your classes so you can learn at your own pace, and you have the added comfort of being able to watch the lessons in brilliant high definition, rewind, make notes, ask questions, and get answers from me and your classmates. Plus, you can browse other people’s projects for inspiration, and upload pictures of your projects to get feedback and insight. Enroll in Kids Romper Revamp, and create a comfy, yet stylish, custom girl’s romper, learn new sewing skills, and have fun doing it!